The OMEGA Ladymatic is a mesmerizing blend of extraordinary design and truly innovative watchmaking. It was crafted for the woman who cares as much about the technology in her timepiece as she does its appearance. This OMEGA Ladymatic features a an imaginatively designed dial in 18K yellow gold with mother-of-pearl marquetry and diamonds set in the shape of a flower made up of five interlocking OMEGA logos. The exquisite dial is visible through a scratch-resistant sapphire crystal. The bezel is paved with 184 full-cut diamonds and is mounted on a 34 mm 18K yellow gold case. This timepiece is presented on a white satin-brushed leather strap with 18K yellow gold links decorated with diamonds in a snow-set pattern. 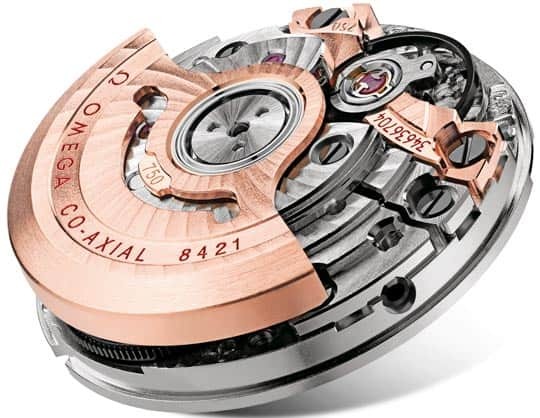 The transparent caseback makes it possible to view the OMEGA Co-Axial calibre 8421 movement within.